Download "2015-16. 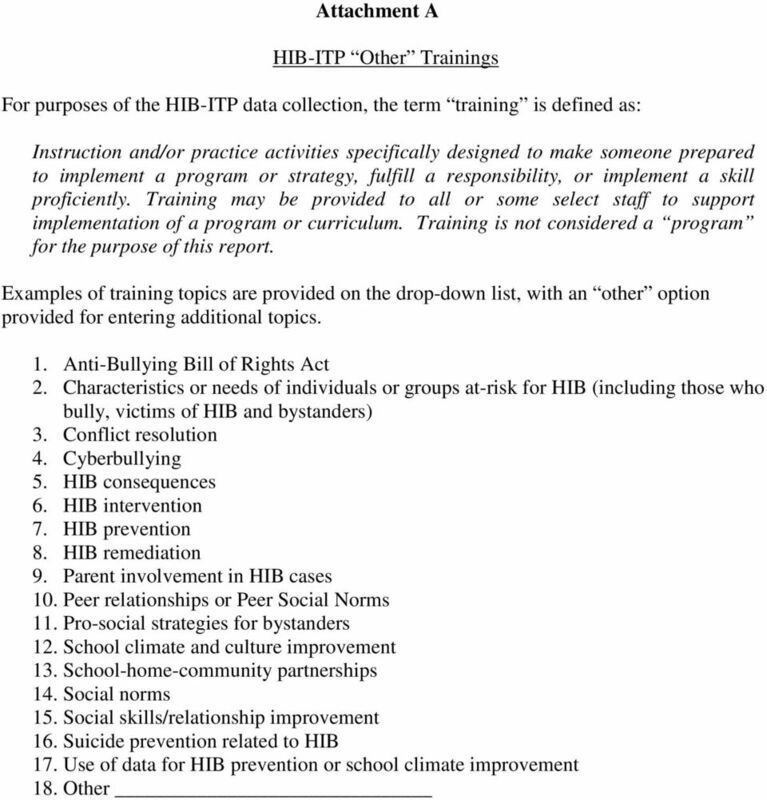 July 1 Dec. 31 for HIB Trainings and Programs Sept. 1 Dec. 31 for HIB Investigations and Incidents"
2 Programs Provided For the purposes of the HIB-ITP data collection, the term program is defined as an event or a planned system of organized activities or procedures under which action may be taken toward a goal. Please provide information for all HIB Programs/Approaches/Initiatives, other than trainings, conducted during the reporting period. If the program/approach/initiative was implemented in each school in the district, check DISTRICT-WIDE PROGRAM and enter the information once. If the program/approach/initiative was implemented in some but not all schools, enter the information for each school. 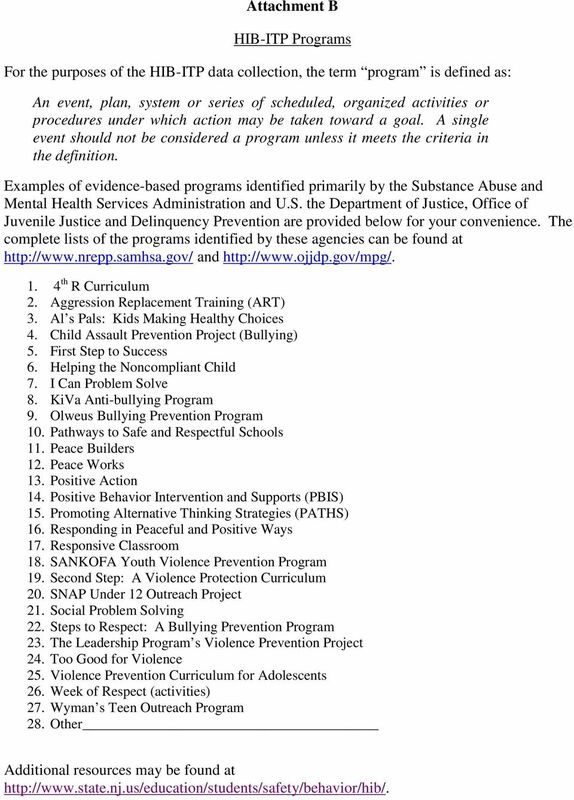 Please select the type of Program/Approach/Initiative that was implemented from Attachment B. Other Program not listed on Attachment B: (Limited to 50 characters) (A single event may be considered a program when it meets the criteria in the definition for program.) Check if training was provided for the program selected. Start Date: Duration #: Hours per day Days per week Weeks per reporting period Target Population of the Program: (please check all that apply) Board of Education Members District-Level Administrator District Anti-Bullying Coordinator School-Level Administrator Student Support Services School Anti-Bullying Specialist Teachers Students Parents Other School Staff Contracted Service Provider Volunteers Other The program/approach/initiative was designed to focus on the following school-wide conditions to prevent and/or address harassment, intimidation and bullying: (Check all that apply. See Domains of Safe and Supportive School Conditions for Learning, Attachment C, for guidance for the schoolwide conditions listed below.) Physical Environment Emotional Environment Teaching and Learning Student Relationships Parental Support Morale in the School Community Safety Provide the name and position title for the person primarily responsible for assessing the program. 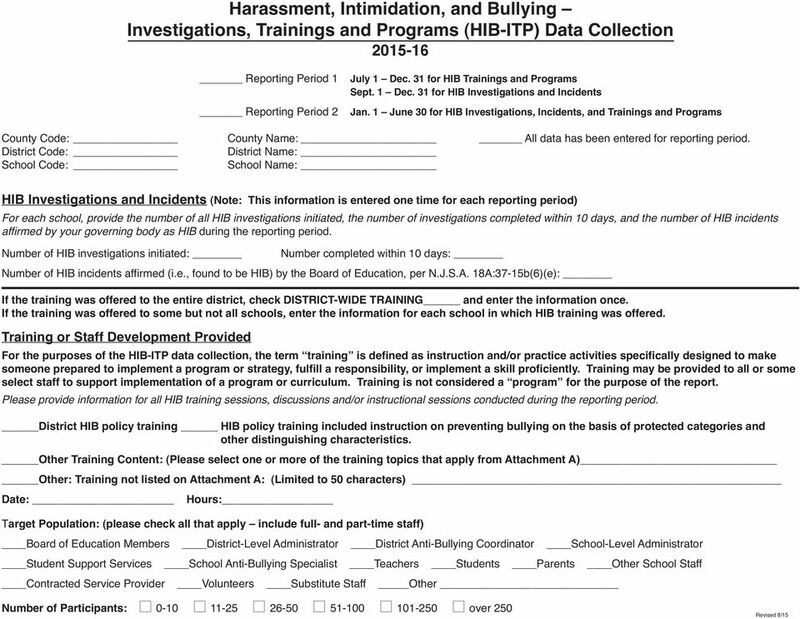 First Name: Last Name: Position Title: (Drop down from below) Chief School Administrator District Anti-Bullying Coordinator District Board of Education School Anti-Bullying Specialist Other District-level Administrator Principal School Safety Team Other School Staff Other School-level Administrator Outside Evaluator NOTE: All supporting documentation must be kept on file in the district and made available to the NJDOE upon request. Administrative Procedure 316 BACKGROUND DIVISION-WIDE BULLYING PREVENTION Grande Yellowhead Public School Division believes that all students and staff have the right to a safe and healthy school environment. BULLY PREVENTION: ARE YOU PROMOTING HEALTHY RELATIONSHIPS IN YOUR CLASSROOMS AND SCHOOLS? Decreasing bullying, youth violence and criminal behavior as well as promoting healthy development social and emotional learning.